Anti-Mormon zeal brings a high human cost, in my opinion. Sometimes I see people who seem to value attacking Mormonism more than actually helping the people they are supposedly trying to save. For some it seems more desirable to drag people into anything other than Mormonism. For some any tactic seems justified to "rescue" a Mormon. A painful example I am watching involves the ex-husband of a relative of mine who is so keen on keeping his troubled young adult daughter away from Mormons that he did all he could to pull her out the safe setting she had finally found with LDS relatives and bring her back near a place where she had previously been entangled in drugs and other horrific problems. She has been rescued from the Mormons, where she was engaging in such vices as prayer, attending sacrament meetings, and having a steady job and a drug-free life. Back near her old friends and away from the support she needed, she is now on the path of tragedy and self-destruction. But at least she isn't acting like a Mormon. It's not all his fault, of course, but his intervention to bring his daughter away from Mormons, fueled by his anti-Mormon zeal, was a critical turning point. We are praying that there will be another turning point toward healing and happiness again. I know many who leave the Church publicly declare how much better their lives are when they leave. It may be so, and some did face genuine problems, pressures, or disappointments in the Church. There are good people who leave the Church for what may be good reasons to them, and I know some who go on to have productive, happy lives with good relationships and good careers and meaningful service to society. I hope people of any faith will experience such blessings and success. But I think there is great joy that the LDS faith, properly lived and understood, brings into the lives of its members. Breaking that connection is not worth the zeal that many put into their anti-Mormon efforts. The LDS faith has never been an especially easy religion, and our human mistakes in the Church can make it much worse and unnecessarily difficult for some. Yes, there are genuine complaints that sincere former members can raise. But a high fraction of the people I know who have left the Church seem to have lost a great deal in their lives. Especially when the move out of the Church is into a world without the grounding of religion, the loss and the pain seems to be great, as it is for the young adult woman we know and love who is entangled again with destructive influences. Is her father's gain worth what she has lost? Those who remember God, at least those who believe in God and participate in organized religion based on studies in the US and Europe, as Peterson discusses in his presentation, experience higher mental health, physical health, healthier marriages, higher rates of charitable giving and service, and many other factors that our society should welcome and encourage. Instead, though, religion, particularly Christian religion, is disparaged from numerous angles by the elites in our society. Perhaps not all of these benefits are experienced by Mormons, but in my experience all or nearly all are. Fortunately, some members of the Church if they choose to leave stay involved in many of the good things they were doing before -- service, family prayer, diligent study, temperance, etc. -- but too many drift into other paths, far from their roots, far from where they should be, and find themselves allegedly happier but without the grounding the Restored Gospel gave them. Losing faith in God is not a healthy step, in my opinion. Giving up on prayer and the grounding of a personal relationship with Christ and the gifts of the Holy Spirit represents a tragic loss, in my opinion. May we do a better job in helping our people grow in their faith and find the fullness of joy that is possible with the Gospel of Jesus Christ. There is much to lose, and yes, it does make a different because, as Peterson explains, Christ makes all the difference. Neal A. Maxwell Institute for Religious Scholarship*: Collection of scholarly research designed to deepen understanding of religious texts and traditions. The single asterisk means that the website is "maintained by a third party that is affiliated with the Church," which is BYU in this case. Book of Mormon Central**: Information that was created to explain, engage, inspire, and encourage greater knowledge and appreciation of every aspect of the Book of Mormon. FairMormon**: Well-reasoned and faithful responses to doctrinal, historical, and social questions. Mormon Scholars Testify**: Messages of faith from scholars who belong to The Church of Jesus Christ of Latter-day Saints. The Interpreter Foundation**: Nonprofit, independent, educational organization that focuses on the scriptures of The Church of Jesus Christ of Latter-day Saints. They publish a peer-reviewed journal, Interpreter: A Journal of Mormon Scripture. Here the double asterisk means the sites "are maintained by a third party that is unaffiliated with the Church." I was quite happy to see these resources listed at LDS.org. I find Book of Mormon Central. FAIRMormon, and The Interpreter (MormonInterpreter.com) to be extremely useful in exploring and understanding the LDS faith, even if I don't always agree with some of their content (as demonstrated by my recent criticisms of a recent three-part series at The Interpreter). By the way, the Interpreter just published my review of Brian Stubbs' outstanding work. See Jeff Lindsay, "The Next Big Thing in LDS Apologetics: Strong Semitic and Egyptian Elements in Uto-Aztecan Languages," Interpreter: A Journal of Mormon Scripture 26 (2017): 227-267. There are some good questions already that I am trying to respond to. Then on August 16, 2017, Elder Jeffrey R. Holland of the Quorum of the Twelve dared to show his face at an apologetics fest of sorts at BYU, the celebration of 50 years of chiasmus research in the Book of Mormon. He not only showed his face, he spoke to teeming crowd (I wasn't there, but can only imagine the throngs of LDS folks and investigators keenly interested, as they should be, in this inspiring area of Book of Mormon scholarship -- there could have been literally dozens, for all I know). Not only did he speak, but a transcript of his important remarks were quickly posted at the Church's news site, MormonNewsroom.org. I am not kidding! And not dreaming, either. See "Transcript: Elder Holland Speaks at Book of Mormon Chiasmus Conference" at http://www.mormonnewsroom.org/article/transcript-elder-holland-speaks-book-of-mormon-chiasmus-conference-2017. I wish to say at the outset that the presiding officers of the Church appreciate and applaud the exceptional work being done by so many to search and to substantiate, to defend and promulgate the history and doctrine of The Church of Jesus Christ of Latter-day Saints, including and especially the Book of Mormon, in a way both scholarly and spiritual. Obviously one of the influential, representative figures in this generation of such work is our friend and colleague John W. Welch, being honored tonight. I have known and loved Jack and other members of the Welch family for at least 40 of the 50 years we are commemorating. In deference to the clock I will not recount all of his academic accomplishments (much of which has been referenced here tonight), but suffice it to say, Jack, that the Brethren are grateful for your faith, your loyalty, your productivity, and what is increasingly your scholarly legacy in defending the kingdom of God. That compliment is, of course, extended to a legion of other men and women across the Church who are putting their shoulders to the wheel of reasoned, determined, persuasive gospel scholarship. He then goes on to explain why it is important to have intellectual reasons and tools to defend the Gospel, and explains that testimony involves both heart and mind, affirming the need for intellectual understanding to help support faith and overcome the obstacles to faith. In other words, there is a need for LDS apologetics. Thank you, Elder Holland! Regarding the defense of the faith through scholarship and intellectual argument, the domain of apologetics, I've heard a variety of misconceptions over the years. Some LDS voices say the Church is embarrassed by apologetics and thus refuses to give credibility to those efforts. On the other hand, some say the Church relies heavily on apologetics to defend the Book of Mormon, for example, to support missionary work and keep members believing, but due to the weakness of the LDS position, the Church officially keeps a large distance publicly from apologists. That way, when apologetic efforts fail miserably, the Church can ignore the problem and avoid direct embarrassment. Critics often ask why the Church doesn't directly do the work of apologists and get involved in an official way in issues like Book of Mormon geography or other issues in apologetics. The answer to me seems rather simple. As in most major religions, central leadership is involved in the administrative and spiritual aspects of running a religion. Dealing with the endless arguments against faith that can be made and responding to critical works ranging from deep scholarship to lurid rumor-mongering is simply not the primary focus of headquarters, and must rely on others. Scholars, schools, and publishers may be encouraged and helped in various ways, but the secular arguments and scholarship needed to better understand or perhaps buttress the faith is not something that normally is handled directly by official efforts from headquarters. There are counterexamples, of course, but in general, it is entirely reasonable that the details of say, the defense of the Bible against the claims of "biblical minimalists" should be left to outside scholars. The Church usually does not need to take official positions on matters of science and scholarship. It can proclaim that God created man without needing to decide how the Creation accounts can be squared with modern science. It can declare that the Book of Mormon is a genuine, ancient document delivered to us through the power of God, without taking official positions on the significance of Hebraic poetry like chiasmus or resolving the location of Zarahemla or the specific animal species that Book of Mormon writers were looking at when they described "horses," "wild goats," or "cureloms" in the New World. While the Church did turn to a variety of scholars for input in responding to popular criticisms of the Book of Mormon based on DNA research and issued a helpful "Gospel Topics" paper, "Book of Mormon and DNA Studies," that exceptional paper still leaves most of the thinking to us and primarily serves to remind us of how much we don't know. Likewise, regarding chiasmus, the Church does not need to take a position on its use and significance in the Book of Mormon. But it's cool, very cool, that Elder Holland would come to the jubilee celebrating the discovery of chiasmus and give a pro-apologetics speech while there. It's been an interesting month for LDS apologetics, a field on its way to one day, perhaps -- who knows? -- becoming cool. Bonhoeffer gives a clear reminder of what marriage is meant to be, in my opinion. Terribly unpopular words today, but worthy of consideration. This won't win arguments with critics, but for those wondering how to approach the topic of marriage from the perspective of faith, Bonhoeffer's words and Elder Christofferson's further comments might be helpful. Of course, we live in an era of complexity where we often need to work closely with and respect those with many different perspectives, tendencies, lifestyle choices, and beliefs, perhaps even in our own families. But somewhere in there, understanding our own beliefs and being able to explain them when someone wishes to understand is a positive step. Science and religion are two independent witnesses of God's Creation, according to a beautiful video interview of LDS scientist Dr. John Lewis, formerly of the University of Arizona and MIT, which is prominently provided at LDS.org. Lewis makes a very pro-science statement in his interview, though the emphasis is on expressing his faith and his witness of the divine Creation. For those dealing with some of the tensions between science and religion, it's helpful to understand that the Church does not take an official view on the details of the Creation process for the earth and does not require the earth to be young, nor does it deny the possibility of evolutionary forces being an important tool in the creation of life. There have been conflicting statements over the years, and even some confusion about the nature and content of some statements. 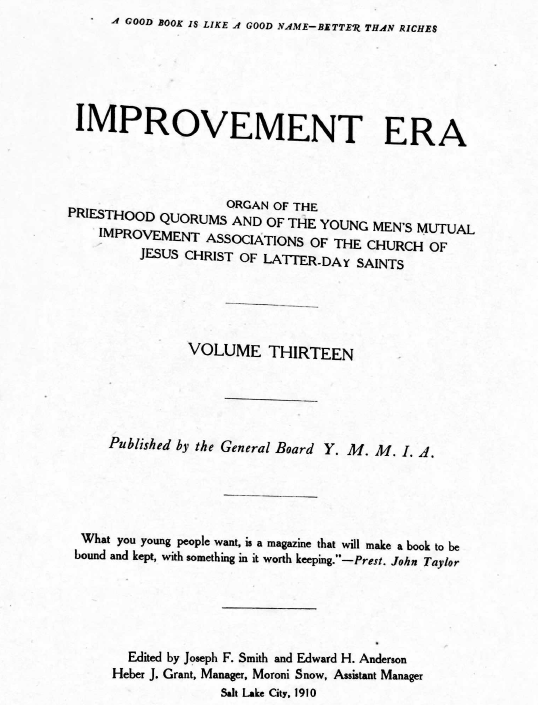 Some LDS publications, for example, have cited an open-minded 1910 statement as a "First Presidency Statement" (one example). In my recent post on day two of the 2017 FairMormon Conference, I mentioned that one presenter referred to a 1910 First Presidency Statement, but I wasn't sure if that reference was accurate. The presenter, Ugo Perego, who had taken the quote from a secondary reference that described it as a "First Presidency Statement," kindly followed up and found the source of the original text. It comes from an unsigned editorial in the 1910 Improvement Era (the official Church magazine of that day), vol. 13, p. 185. 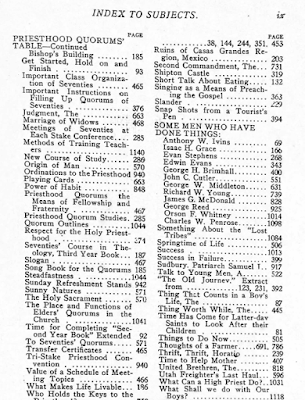 At this time, the editors listed were Joseph F. Smith, President of the Church and Edward H. Anderson. Brother Anderson was not a General Authority; at the time, based on his Wikipedia entry, I believe he was in the Weber Stake High Council, which is not quite the same. President Smith might have helped in writing it and most likely approved it, but that doesn't make it an official First Presidency Statement. But I like it. Origin of Man.-- "In just what manner did the mortal bodies of Adam and Eve come into existence on this earth?" This question comes from several High Priests' quorums. Of course, all are familiar with the statements in Genesis 1: 26-27; 2: 7; also in the Book of Moses, Pearl of Great Price, 2: 27; and in the Book of Abraham 5: 7. The latter statement reads: "And the Gods formed man from the dust of the ground, and took his spirit (that is, the man's spirit) and put it into him; and breathed into his nostrils the breath of life, and man became a living soul." These are the authentic statements of the scriptures, ancient and modern, and it is best to rest with these, until the Lord shall see fit to give more light on the subject. Whether the mortal bodies of man evolved in natural processes to present perfection, through the direction and power of God; whether the first parents of our generations, Adam and Eve, were transplanted from another sphere, with immortal tabernacles, which became corrupted through sin and the partaking of natural foods, in the process of time; whether they were born here in mortality, as other mortals have been, are questions not fully answered in the revealed word of God. 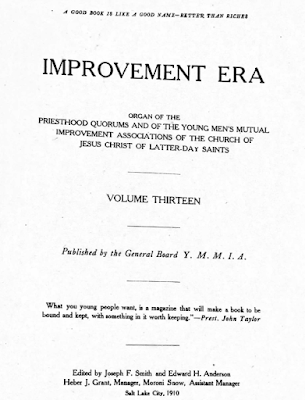 For helpful discussion of the subject, see Improvement Era, Vol. XI, August 1908, No. 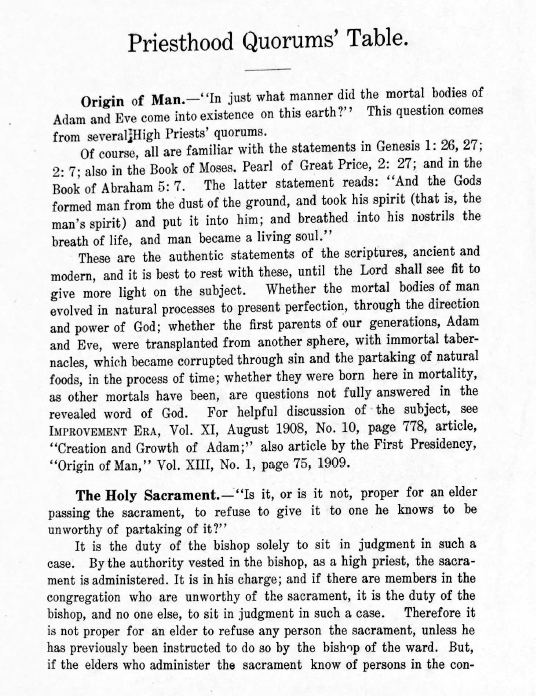 10, page 778, article, "Creation and Growth of Adam;" also article by the First Presidency, "Origin of Man," Vol. XIII, No. 1, page 75, 1909. 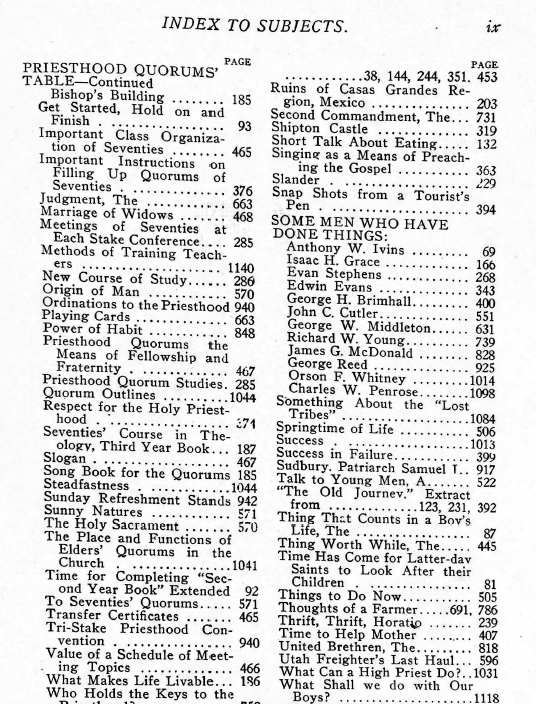 Editorial (unsigned) [Joseph F. Smith as president of the Church and Edward H. Anderson were editors], "Priesthood Quorums’ Table," Improvement Era 13 no. 4? (April 1910), 570. This leaves open the possibility that evolution played a role in developing the human bodies of Adam and Eve and all of us. It's a noteworthy moment in the history of LDS teachings relative to evolution. For more details, see David H. Bailey, "History of the LDS Church's view on the age of the earth and evolution," Jan. 1, 2017, at ScienceMeetsReligion.org. David H. Bailey is a scientist from Lawrence Berkeley Laboratory (recently retired) and the University of California, Davis. Also see his collection of 14 LDS-related pages on science and religion. Also see my LDSFAQ (Mormon Answers) page, "Questions about Science and Mormon Views." Disclosure: In fairness, I have to admit that I love science and my religion, and am invested in both. The day began with an outstanding presentation from Ben Spackman who discussed what it takes to properly understand scripture. He discussed the reality of accommodation, wherein God's words to us do not necessarily refute all our misunderstandings and ignorance at once, but address us in ways we can understand. Further, he stressed that we can consider scripture like a map. A map inevitably leaves out a great deal and often deliberately distorts reality in order to achieve its purpose, just as a two-dimensional map of the earth such as the Mercator Projection will distort distances, or as a map of a subway system will not only distort distances but also be useless for navigating streets, hiking, or mining. Taking Genesis as a map useful for understanding 21st century scientific issues such as cosmology and the literal scientific details of the Creation might be like using a subway map to plan a mining expedition. Ben recommend a good list of resources on dealing with scripture from the excellent blog, Benjamin the Scribe. Ugo Perego, a scientist with a strong background in genetics and DNA, spoke about the Church's position on evolution, which as you should know leaves us open to accept what science teaches and does not require us to force-fit our beliefs into young earth models of the Creation. He began with Doctrine and Covenants 101:32-34 which points to a future science fest in which the Lord will tell us all about the things of the earth, the way it was made, etc. This indicates he will be revealing things we don't know. If we think we know it today, we may have a surprise coming. In my opinion, this passage is one of many that should encourage us to care about science since the Lord obviously does. 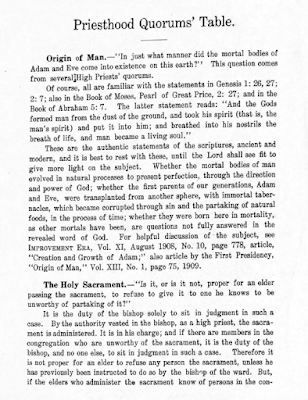 While the Church has said relatively little about evolution, Brother Perego discussed a 1909 First Presidency statement on the "Origins of Man" and also referred to a First Presidency Statement in 1910 that he said clarified the previous statement and said that whether the mortal bodies of man evolved over time or were transplanted to earth or were born here, are "questions not fully answered in the revealed word of God." But I think this may be in error, and that the 1910 statement that has often been widely quoted was not really a First Presidency Statement. He's checking on that (based on a chat with him afterwards). I hope the 1910 statement is legitimate, but while it is printed in a variety of books and articles, it may be problematic. If you have definitive answers, let me know! It is not at LDS.org based on my searching. The details of what happened on this planet before Adam and Eve aren’t a huge doctrinal concern of ours. The accounts of the Creation in the scriptures are not meant to provide a literal, scientific explanation of the specific processes, time periods, or events involved. The Church has no official position on the theory of evolution. Organic evolution, or changes to species’ inherited traits over time, is a matter for scientific study. Nothing has been revealed concerning evolution. Bruce R. McConkie noted that a "day" could be an age, an eon, or a division of eternity. He said there is no revealed guidance that the days of Creation were 24-hour days. As Hugh Nibley noted, Abraham 4:20 says that God prepared the waters to bring forth life such as whales. Sounds as if they weren't instantaneously created, but the waters were made ready to allow them to develop. Perego then turned to the topic of DNA and the Book of Mormon. While not specifying what geographic model of the Book of Mormon is best and warning that we need not do that, he said that the Heartland Model advocates who are claiming DNA evidence proves the Book of Mormon is true are abusing science. In specific, the hapotype X2a DNA that has been found has no bearing on the Book of Mormon, but is a New World DNA from the ancestor of Kennewick Man and was present in the Americas long before the Book of Mormon. It does not support a Great Lakes model of the Book of Mormon. Perego has studied and published on more sequences of X2a than any other scientist and is an expert on this topic. As of today, clear genetic evidence of ancient Old World transoceanic migrations other than Bering Strait migrations does not exist. Regarding a recent study on ancient Mayan DNA samples, Perego noted that the authors in correspondence with him said that one sample "did not work." Perego asked what that meant. Answer: "The DNA was not what we expected." It was rejected during review and they were asked to remove the unexpected sequence. (This is a danger I have noted in my paper on the Book of Mormon and DNA evidence, where I give some examples of unexpected DNA results being discarded that might have pointed to Old World ties in ancient Native American DNA.) Perego emphasizes that there is still much that we do not understand. For example a 2107 publication in Nature on the genomic era shows that there are studies showing possibility of genetic contact between South America and Polynesia. Which way was the gene flow and how? There is still much we don't known. Perego advises that DNA and the Book of Mormon is an interesting topic, but not one to tie your testimony to, and certainly not a good reason to reject the Book of Mormon or the Church. Dr. Janiece Johnson delivered a strong message on the need to pay more attention to the women of LDS history. Dr. Johnson observed that too long women's voices have not been recognized in the Church, and we have suffered for this. There have been some bright spots, but many women's voices have been overlooked. When asked what women were involved in the Restoration, Lattre-day Saints typically give a list of four women: Mary Fielding Smith, Emma Hale Smith, Eliza R. Snow, and Lucy Mack Smith. Dr. Johnson is pained that the many women of the Restoration have been largely reduced to these four voices. "We need to hear women's voices. We need to read their words. We need to hear their experiences." To illustrate the diversity in the lives of major women in the Restoration, she contrasted Eliza R. Snow and Zina D.H. Young. Zina had a dramatic conversion experience by reading the Book of Mormon, with an almost instantaneous conversion. Eliza, on the other hand, took four years of study to get past her fears that it might be a hoax and become a firm believer. The diversity in the conversion stories of early LDS women reminds us of our diversity today and the different approaches and needs we have as we encounter the Gospel. There is much to learn from the stories of these early Saints. In February 1880, Desideria claimed to have a dream about a pamphlet called "Una Voz de Amonestación" being published by foreigners in Mexico City. Missionaries from LDS Church were, in fact, in Mexico City in the process of publishing a Spanish translation of Parley P. Pratt's pamphlet, "A Voice of Warning," which contained introductory information to the Church. This dream had a great effect on her, and she felt very strongly that this pamphlet would help her spiritually. Because of poor health, she was unable to travel to Mexico City to investigate the veracity of her dream. Her son, José María, went in her place, and was able to meet the apostle Moses Thatcher and other missionaries that had accompanied him, including a Spaniard, Melitón González Trejo (es), who had assisted in the translation of Church materials into Spanish, and James Z. Stewart. José María returned to the village where his mother lived with news of the foreign missionaries and their pamphlet. Since "A Voice of Warning" was still being translated (in part by Plotino Rhodakanaty, a Greek convert living in Mexico City), the missionaries sent other pamphlets back with José María. In 1880, Desideria received the translated "A Voice of Warning," as well as the newly published Spanish translation of selections from Book of Mormon. Desideria was baptized by Melitón González Trejo into LDS Church in April 1880 in her village of Nopala. She was the 22nd person to be baptized into the Church in Mexico, as well as the first woman. Her oldest son, José María and his wife, as well his daughter, Carmen, were also baptized that day. Dr. Johnson reminds us that we can lose ourselves in this world, and through studying the lives of early Mormon women, we can better remember who we are and find our way. It is not only women who need to hear women's stories; we all do. Tyler Griffin, "Book of Mormon Geographical References: Internal Consistency Taken to A New Level"
Tyler Griffin has been leading some amazing work on mapping the scriptures at http://virtualscriptures.org/, which include a detailed internal map of the Book of Mormon. Brother Griffin began by reminding us how young Joseph was as he produced mountains of scripture. He was 24 as the Book of Mormon was published and 31 by the time the Kirtland Temple was dedicated, all with three years of elementary frontier education. As Emma later recollected, "Joseph could neither write nor dictate a coherent well-worded letter" when he dictated the Book of Mormon. It was a marvel to her, clearly far beyond any abilities she had found in him. In November 1832, Joseph begins a personal journal. It begins with a botched paragraph that he crosses out. And it reads like the writing of a farm boy, not like the Book of Mormon. One of the interesting things about the Book of Mormon is what went to the printing press: pretty much the rough draft as dictated by Joseph. When you compare Joseph Smith the man to Joseph Smith the Prophet, there is a world of difference, as Brother Griffin observes. There are over 500 references to geography in the Book of Mormon. Once Nephi gets us to the New World, his interest in geography is negligible. We don't pick up details of geography until we get to Mormon's abridgements. Mormon, unlike Nephi, cares about geography a great deal. Given Mormon's military career where a mastery of geography is a regular matter of life and death, this makes sense to me. Nephi, though, is largely focused on theology. Thus we have different flavors in the Book of Mormon relative to geographical detail depending on the author and context. The vast majority of geographical references are in the land of Zarahemla, which is what Mormon knows best. With over 500 references to geography and stories separated by hundreds of pages dealing with the same places, we somehow maintain nearly perfect consistency. "This book is so good that even when it's wrong, it's right." E.g., Alma 24, they "buried their weapons of peace, or, they buried their weapons of war, for peace." A remarkable textual clue pointing to a real man engraving text on an unerasable medium and making an alteration to fix a mistake. If a farm boy were making this up and made that mistake, he's say, "Oliver, scratch that and write "weapons of war for peace." Here we see Mormon making a mistake and moving on. A subtle hint of the authenticity of this ancient text. After Ether 12:27, Mormon does not compare himself to others again regarding his weakness in writing. Griffin has worked on making an internal map based on internal evidences. One of the key references for the map is Alma 22, where there is a description of the land southward and northward with a narrow strip of wilderness, etc. There is a wilderness west and east of Zarahemla. Many geographical issues. Some come from migrations. Migrations of people tend to be north. This was completely contrary to Joseph's environment, where migrations would be south or west. Alma 63:5-9 involves Hagoth who leaves from the west sea on a large ship and they go north. He comes back and build more ships and goes again. Helaman 3:3-14 mentions other groups leaving and going far north, even until they came to a land covered with many waters and rivers. This northward tendency opens up opportunities for research. Where should we look for linguistic evidences or other traces of Nephite and Lamanite culture? If Book of Mormon were written to show where Indians came from, the Book of Mormon does a poor job. No teepees, no tomahawks, no mocassins or peace pipes. Nearly all of the traditional trappings of Native Americans likely to be known to Joseph Smith and his audience are absent. Three week's journey separated Mulekites from the Nephites for 350 years. Nephite enter their home turf and take over politically. This sets stage for later people to challenge the Nephite political system and claim to be of noble birth -- probably a reference to descent from Mulek. Any lens you use to look at the book, whether political, cultural, geographical, linguistic, theological, etc., the book is remarkable, and difficult to explain as a farm boy's rough draft. The land of Nephi is always up, Zarahemla is always down, across the Book of Mormon. Remarkable consistency (I think that is just like Nephi always speaking of going up to Jerusalem and down to the wilderness). For 19th century people, northward is usually up, so this doesn't fit Joseph's environment. Even today, I would say, Americans tend to go "up" when going north and "down" when going south. Moroni on east coast, lowest, followed north by Nephihah, Lehi, Omner, Gid, and Mulek. Land of Bountiful has to be close enough to sea shore for Teancum to go in the night to slay Amalickiah in his sleep. Last thing he would have done would be to choke on his own blood, in contrast to his oath to drink Moroni's blood. My question was this: "Don't some major geographical details like apparent volcanism in 3 Nephi or a Sidon that flows north immediately rule out some geographical models?" His answer is that he seeks to leave open possibilities. Some deeply believe the Book of Mormon took place in Baja or South America, etc., and doesn't want to rule things out for them. He prefers to keep things open as much as possible. I guess I can't complain about that, though I think we need to help people think about the plausible physical places where the text could actually have taken place. Brant Gardner began by asking why in the world would Joseph have thought of putting a rock in a hat as a way to solve his problem, the problem of translating the unknown language on his gold plates. Brother Gardner suggests the reason is that he thought of something he was already familiar with. Gardner suggests that Joseph initially used the interpreters that came with the plates only to do that which he had always done with seer stones: to find things, namely, to check on the location of the plates. Gardner notes that the use of the hat to block out light might be a way to let others know that the seeing taking place is something unusual and miraculous. He explained that we struggle with the problem of "presentism," citing Lynn Hunt's "The Problem of Presentism." The things that bother us the most are when we find people in history who should be like us but aren't. If we learn of something strange from people living on a remote island, we can accept it. But if we say Joseph Smith used a seer stone, it will bother us. Joseph's divining cup in Genesis 44:5 doesn't bother us. Omens were based on the appearance of liquids in the cup -- weird, but not something we have to worry about. If Joseph Smith had used a divining cup to translate the Book of Mormon, we would find it strange and troubling. Money digging is weird today, but was common in Joseph's day. Wayne Sentinel, Feb. 16, 1825, mentions there might be 500 respectable men in the area engaged in diligent money digging activities. Fawn Brodie quotes this. Today we have the lottery -- same silly reason. People in difficult circumstances often look for easy way to gain wealth. Gardner suggested that the Book of Mormon itself can act as a seer stone, a tool to help us learn directly from God and experience divine communication. It has changed people's lives, helped them find divine guidance, and brought long-lasting blessings to many lives. Gardner was asked about Stanford Carmack's and Royal Skousen's theories on translation of the Book of Mormon (e.g., generally tight control to give a text often showing Early Modern English influence that cannot be accounted for by theories based on copying KJV language). Gardner has a difference of opinion about what the data means. That's pretty much all he would say for that question. Gerrit Dirkmaat, "Lost Teachings of the Prophets: Recently Uncovered Teachings of Joseph Smith and Others from the Council of Fifty Record"
Dr. Dirkmaat is an assistant professor of Church History and Doctrine at Brigham Young University with a PhD in American History from the University of Colorado. He worked as a historian and writer for the Church History Department from 2010 to 2014 as historian on several volumes of the Joseph Smith Papers project. Since taking his position at BYU, he continues to work on the Joseph Smith Papers as a historian and writer. He currently serves as Editor of the academic journal Mormon Historical Studies, published by the Mormon Historic Sites Foundation, and on the Church History editorial board for BYU Studies. He is the author of dozens of scholarly articles and is the co-author, along with Michael Hubbard MacKay, of one of my favorite books, From Darkness Unto Light: Joseph Smith’s Translation and Publication of the Book of Mormon, published by Religious Studies Center at Brigham Young University and Deseret Book, 2015. He began by telling the story of Joseph's decision to run for president after becoming disenchanted with the Democrats and the Whigs, who were unwilling to bring relief to the persecuted Mormons. American democracy had failed the Mormons. Interestingly, in the 2nd paragraph of his declaration of his views on "Powers and Policy of the Government" was an attack on slavery. Dirkmaat then turned to the newly published documents from the Council of the Fifty Record. Joseph wanted the Council to speak their mind, and if they wouldn't, they'd be no better than a "doughhead." The Council sought to propose a constitution for the kingdom of God on earth, a bold and daunting task. But their discussions reflected a great deal of disappointment toward the government of the US and their failure to protect their rights. Sense of loss of bitterness is reflected, and a feeling that they are being driven out of the nation. They consider various places that will be outside of the United States in order to live their religion in peace. Texas in one candidate, and representatives are sent to discuss possibilities. But is during one of their meetings, as Texas is being discussed, when a messenger comes in with the news that Texas was just annexed by the United States. Upper California in Mexico and Oregon were also considered. Dirkmaat noted that Joseph wanted non-Mormons to be on the Council and that he was passionate about religious liberty for all. He wanted all in the Council to have total liberty to embrace the light they saw. He was not afraid to have ministers from other religions preach to his people. He preached against religious intolerance and wanted to preserve the rights of all to believe as they wished. "We must not despise a man on account of his infirmity; we ought to love the man more for his infirmity." He urged others to "drive from us every species of intolerance." Those who reject the Gospel should be embraced with the same charity from the Latter-day Saints and should enjoy the same rights to liberty in our midst as those who fully accept the Gospel. Dirkmaat noted that after reading the Joseph Smith papers, one thing that especially stands out about Joseph Smith is that he had a great love for other people. His statement that we should not despise others for their infirmity is one of the most beautiful expressions from the 19th century. Daniel Peterson, "What Difference Does It Make?" The closing speaker will be the venerable Daniel Peterson, one of the most vilified and respected defenders of the faith. It has been great to meet Daniel and other major forces in LDS apologetics here, many for my first time. Faith is viewed as a mental illness by some of the intellectual elites of our day. Is atheism healthier than faith, Peterson asked? Armand Nicholi, Jr., in The Question of God has C.S. Lewis debate Sigmund Freud on various topics. Though the two never met, Lewis was in a good position to consider both sides of the issues since he spent about half of his life as an atheist. Lewis arguably led a healthier and happier life than Freud. Peterson points to studies showing the benefits of religious faith on the health and happiness of believers. This doesn't prove that religion or belief in God is true, but does discount the claim that faith is an illness. Rather, it seems to make us healthier. Andrew Sims in Is Faith Delusion? Why Religion is Good for Your Health, he notes that a majority of studies exploring the impact of faith show that it is linked to reduced rates of suicide, healthier lives, reduced mental illness, less criminal activity, better marital stability, better social support, better coping with crises, reduced depression rates, and better general health. If study after study were showing that religion is harmful for numerous areas of health, it would be shouted from the front pages of the media. But these studies get very little attention. In 84% of 68 studies, those with religious faith are less likely to commit suicide. "The nagging question we are left with is why is this important information ... not better known?" Governments and health care organizations should be rushing to encourage faith to elevate the heath and well-being of the nation, Sims suggests. In Gross National Happiness (2008) by Brooks, religious people of all faiths are markedly happier than secularists (42% vs. 28% reporting they are happy in their lives). Those who pray daily are much more likely to consider themselves happy. Oddly, agnostics tend to be less happy than atheists. People in religious communities are more likely to be financially successfully. There are benefits that accrue to a community as a whole when there is a high level of religious activity. The more your neighbors go to church, the more likely you are to be financially successful, according to Brooks. Atheists sometimes, rather condescendingly, tell believers that they should enjoy the amazing ride of this life rather than spending so much time fretting about the next life and preparing for it that they miss out on the present life. But this is an erroneous statement, for there is no evidence that believers miss out on the joys and benefits of the ride here in mortality, or that they spend so much time preparing for the next life that they miss out on this. In fact, those with faith tend to live richer, more fulfilled, and longer lives than those who tell us to quit fretting about the next. On what grounds can a follower of Richard Dawkins demonstrate Iago's lethal immorality to be wrong? Peterson also turned to Rodney Stark's book, The Rise of Christianity: How the Obscure, Marginal Jesus Movement Became the Dominant Religious Force in the Western World in a Few Centuries. Starks shows that Christian communities were more likely to survive disaster (plagues, etc.) than pagan communities apparently because of their willingness to serve and care for each other in times of trouble. Religious people are far more likely to support charities, to help the poor, and in general to strengthen their communities and serve others. They are more likely to be active in civic matters and donate their time to build their communities. Stark points out that religion shows that rather than being a mental illness, those with religious faith are far more likely to have mental health. In addition, religious husbands are far less likely to abuse their wives and children (contrary to the images the secular Hollywood community tends to feed us). The average life expectancy of religious Americans is more than 7 years longer than for the non-religious. Religious Americans are more likely to be successful in their careers. They are less likely to believe in the occult and paranormal, and are more likely to patronize the arts. The accusation that religion is unhealthy and antisocial is strongly contradicted by data from numerous sources. Religious people are more likely to be involved in club, social organizations, etc. If societies wish to encourage better health, happiness, and stronger communities, they should encourage religion, not bitterly oppose it. Religion matters. Faith matters. Truth matters. And the truth is that religion in general is healthy. And for that reason, I might add, the ability to defend religious faith from spurious attacks, no matter how vocally and popularly proclaimed, is vital for those of us wishing to make this life better, happier, and healthier for our families and neighbors. I concluded my post yesterday thinking that Daniel Peterson was about to finish. I published it just before my computer would run out of power. But there is more to add. The bulk of the studies referred to, as I learned during the Q&A, came from work done in North America and Europe, which means they were evaluating the impact of Judaeo-Christian religion. Conducting similar studies in, say, China or Islamic nations tends to be more difficult. At the point where I thought Peterson had beautifully illustrated his point about how religion matters and was about to wrap up, he made what seemed like a surprising turn as he illustrated the sorrow and disappointment of life by reviewing some details from the lives of remarkably capable human beings like Max Planck and Beethoven. He told the story of Beethoven's loss of hearing and tragically short life, unable to hear his greatest masterpieces, and asked how much more this man might have achieved had he been healthy and able to hear? So many previous lives are filled with missed opportunities, with potential unfulfilled, with sorrow and tragedy. Are the atheist right that all this is cause for despair and grounds for denying the existence and mercy of God? Then Peterson turned to the core message of the Gospel of Jesus Christ and spoke of the Savior and His infinite love and sacrifice for us, His conquest of death and sin that is able to embrace all of us and life us from our tombs of despair and give us joy and eternal hope. Through Him and His victory, all of our tears from our failures, the injustice we suffer, the tragedies and sorrows of mortality, can be wiped away in His love. We can rise again and have endless joy and opportunity, being lifted to a path of eternal growth and beauty. We can realize our endless potential through Jesus Christ. Peterson's conclusion was truly inspiring and poetic. Perhaps my favorite moment of many outstanding ones during the two-day event. It caught me by surprise and brought the message of the whole conference together, leading us to contemplate in reverent awe the real reason for defending, teaching, and understanding our faith. Yes, religion matters. Christ matters. He changes everything. Today was my first time attending the FairMormon Conference. The 2017 event is being held Aug. 3 and 4 at the Utah Valley Convention Center at 220 West Center Street in Provo. I was surprised at how large the crowd of attendees was, and was delighted both with the content and also the chance to meet some of the thinkers and writers I've been following for years, including Daniel Peterson, Brant Gardner, Matthew Bowen, Neal Rappleye, Steven Smoot, Scott Gordon, Michael Ash, Mike Parker, etc. The day began with a strong presentation by Neal Rappleye, who plays a key role at Book of Mormon Central. Neal spoke about the need for a mature approach to the historicity Book of Mormon based on understanding the historical context and applying a careful reading of the text. Many readers tend instead to project modern understanding and expectations onto the text which can make it difficult to see the actual evidence before them while jumping to "obvious" conclusions that be disconnected from reality. He compared the Jerusalem of the Amarna Letters to the the Jerusalem of Nephi and showed some fascinating evidences of historicity embedded in Nephi's text based on information that would not have been available to Joseph Smith. His discussion included data showing that metal workers in Nephi's day could also be trained in writing, evidence that military leaders like Laban could have archives of records in their homes, and evidence showing that elite immigrants from the Northern Kingdom (like Lehi, for example) were playing important roles in Jerusalem of that day. His discussion also included a review of an inscription that may have referred to Mulek son of Zedekiah, the growing evidence of New World barley as an important crop in ancient North America (countering the common claim that barley in the Book of Mormon is an anachronism), and the multiple ways in which the brief mention of cement in the Book of Mormon complies with archaeological information about the rise of cement in the northern section of Mesoamerica and the deforestation that was associated with it. It was a well-organized, content-rich presentation. The second speaker was Elizabeth Kuehn with the Joseph Smith Papers project, who discussed many details of the Kirtland Bank disaster and its impact on the early Mormons. This was a case where it was critically important to understand the natural fallibility of mortal prophets. Her presentation, "Finances and Faith in the Kirtland Crisis of 1837," was based on an excellent mastery of primary historical documents and an understanding of the broader economic issues that Kirtland and the entire US faced at the time. Keith Erekson of the LDS Historical Library spoke on "Witnessing the Book of Mormon: The Testimonies of Three, Eight, and Millions." He talked about the proper historical approach to evaluating claims made about the witnesses, illustrating the shoddy methods of, say, Fawn Brodie, who treats a newspaper's reports of statements David Whitmer allgedly made to an unnamed "informant" whose recollection was admittedly unclear as if it were a direct report of Whitmer to the editor, which it was not. Questionable work abounds in which sources aren't given or are obscured, in which evidence is based on hearsay or third-party reports, or in which readers are forced to make false "either/or" conclusions (e.g., the issue of seeing something in a divine vision versus seeing it with one's physical eyes, as if these must necessarily be mutually exclusive when they are not). He reminded us of the powerful and clear statements, over 200 of them, directly from the witnesses to the Book of Mormon, which create a consistent and compelling account for the existence of the plates and the reality of the work of the Restoration. Michael Ash gave a presentation heavy in theory and academics on interpreting history and understanding a sacred record. Matthew Bowen gave a highly informative and rich presentation on the many interesting word-plays involving names in the Book of Mormon but also in the Book of Moses. This deserves a separate post later. How work is some of the most impressive dealing with the Book of Mormon. So many intriguing finds showing the literary sophistication of the ancient writers of our sacred texts. Scott Petersen gave an exciting overview of statemenets from early Christian voices that lend plausibility to many of the unique aspects of LDS theology. I purchased his book, Do Mormons Have a Leg to Stand On? Look forward to reading this. Scott Gordon, head of FairMormon, gave the concluding presentation, "Mormon Temples and Freemasonry," which included useful information about Free Masonry and the LDS Temple, and the substantial differences between them. The elements from Free Masonry apparently adopted for a few aspects of the Endowment ceremony do nothing to undermine the ancient and revealed nature of the LDS Temple. He examined a number of specific arguments made against the Temple based on alleged borrowing from Free Masonry. One of the things I really enjoyed about the conference was the quality of the Q&A after each presentation. There was adequate time for questions and the questions were often meaningful and intelligent, leading to additional good discussion from the well-prepared speakers. I learned a lot and came away more excited than ever at the fruits of scholarship and investigation on LDS topics. I also came away with the need to buy another bag or suitcase to haul all the new books I bought. Kudos to FairMormon and all those who support it and this conference. A+!